Are you an outstanding sanitation and hygiene professional working in Africa? The AMCOW AfricaSan Awards is looking for your nomination. Candidates can submit the nominations no later than January 9, 2019, all information available here. The AfricaSan 5 will be held in Cape Town, South Africa, on February 18-22. The AfricaSan Award aims to raise the profile of sanitation and hygiene by drawing attention to successful approaches, promoting excellence in leadership, innovation in sanitation and hygiene improvements in Africa, and providing incentives for action to ensuring that sanitation and hygiene can be accessed by all, everywhere, and every time required. The nominations must be submitted to africasan5@amcow-online.org. For any questions or concerns, please reach out to africasan5@amcow-online.org with the subject line ‘AfricaSan Awards Inquiries’. The Water Supply and Sanitation Collaborative Council (WSSCC) is pleased to share the following vacancy announcements. Please note the positions, locations, application deadlines and information links below. For more information on salary scales, please visit this United Nations International Civil Service Commission page. Geneva, 28 September 2018: A Human Rights Council resolution urging countries to take decisive action to ensure women and girls have universal access to information, products and facilities needed for improved menstrual hygiene has been warmly welcomed by the Water Supply and Sanitation Collaborative Council (WSSCC). The resolution expresses great concern that the lack of access to adequate water and sanitation services, including for menstrual hygiene management – in schools, workplaces, health centres, and public facilities and buildings –negatively affects gender equality and women’s and girls’ enjoyment of human rights, including the rights to education, health, safe and healthy working conditions, and to participate in public affairs. The resolution encourages states to address the widespread stigma and shame surrounding menstruation and menstrual hygiene by ensuring women and girls have access to factual information, universal access to hygienic products and gender-sensitive facilities, including disposal options for menstrual products. WSSCC welcomes the adoption of this new resolution that makes menstruation explicit and provides guidance on actions to be taken to address this issue. “The updated wording on MHM is a great step towards achieving Sustainable Development Goal target 6.2,” said Virginia Kamowa, WSSCC Technical Expert on Menstrual Hygiene Management. “We look forward to working collaboratively with Member States in the coming months at the global and national level”, she said. On September 17, WSSCC convened a side event at the 39th Human Rights Council on the theme: Realizing the Human Rights to water and sanitation, from menstruation to people on the move. The event provided an opportunity to inform the deliberations of the Human Rights Council and advocate for women’s and girls’ rights to water and sanitation, especially during menstruation. Hosted by the Permanent Missions of Germany, Niger and Spain, the event brought together 19 Permanent Missions present in Geneva. Resolution A/HRC/39/L.11 was passed on 27 September at the 39th session of the Human Rights Council in Geneva in a vote of 44-to-1, with two abstentions. India has taken massive strides towards achieving universal safe sanitation. The number of people without access to toilets in rural India has gone down from 550 million in 2014 to less than 150 million today, through an intensive behaviour change campaign, the Swachh Bharat Mission, which has become a people’s movement. India is on track to achieve open defecation free status by 2019, significantly contributing to the global achievement of Sustainable Development Goal 6 on Clean Water and Sanitation and improving health, educational and other outcomes for millions of people. The Ministry of Drinking Water and Sanitation, Government of India, with support from UNICEF, is organizing the Mahatma Gandhi International Sanitation Convention, MGISC (www.mgiscindia.org) in New Delhi. The convention will bring together ministers and other leaders from over 50 countries around the world in order to both showcase India’s progress and learn about the best Water Sanitation and Hygiene (WASH) practices across the globe. The MGISC is a four-day international conference scheduled to be held from 29 September-02 October 2018 in New Delhi and is being organized by the Government of India’s Swachh Bharat Mission (SBM), or Clean India Mission, the world’s largest sanitation programme. Since the inception of the SBM program, the rural sanitation coverage of India has increased significantly, from 39 per cent in October 2014 to over 92 per cent as of end of August 2018. The number of people without access to toilets in rural India has gone down from 550 million in 2014, to less than 150 million today. According to the latest real-time data, over 83.9 million household toilets have been constructed under the Swachh Bharat Mission. As a result, 21 States/Union Territories, 450 districts, and approximately 450,000 villages have declared themselves as free from open defecation. India is on track to achieve open defecation free status by 2019, significantly contributing to the global achievement of SDG 6. Open defecation can have debilitating impact on the economy. A UNICEF report in 2017 found that if a family invests in a toilet, it will save Rs. 50,000 a year in India. The study conducted across 10,000 households in 12 states, to measure the economic impact of sanitation at a household level, discovered that a single rupee invested in sanitation, allows a family to save Rs. 4.30 by averting medical costs. Sanitation is not just about building toilets but about changing behaviour. Open defecation means that diseases such as cholera, polio, and hepatitis are spread more easily. It means that children are at a higher risk of diarrhoea, which in turn leads to malnutrition. Women are the worst affected due to lack of sanitation facilities. A huge number of pregnant women or new mothers die annually in India from preventable causes. This includes haemorrhage, eclampsia, sepsis and anaemia. Many deaths occur due to poor nutrition and improper sanitation. The success of the Clean India Mission will undoubtedly have a significant impact on the global achievement of SDG 6.2. India is the only country which received special recognition in the Joint Monitoring Programme 2017 update by the WHO and UNICF. The MGISC aims to share sanitation success stories and lessons from the participating countries and culminates with the launch of the Mahatma’s150th birth year celebrations in India, as SBM enters its final year of implementation. The MGISC will be attended by over 50 minister-led delegations from high, middle, and low-income countries including Brazil, Indonesia, Nigeria, and Japan. Participants will gain practical knowledge on key challenges, successes, failures and opportunities, share experiences across regions and with other government decision-makers, and accelerate progress towards ending open defecation as part of the broader effort to achieve SDG Target 6.2 by 2030. Participants will go home stimulated, motivated and empowered as part of a broader sanitation and hygiene movement. A parallel exhibition of sanitation innovations will be held at the meeting venue. WSSCC is inviting you to a session: Realizing the Human Rights to Water and Sanitation: Tackling stigma and discrimination: From menstruation to access to WASH for people on the move that will take place next Friday 14 September 2018 / 13h30 – 15h00 at Palais des Nations, Room XXVII (Geneva, Switzerland). Fore more info, read the Event Program and the Concept Note. Snacks will be provided at 13h00 at the entrance of the room. Please RSVP to anthony.dedouche@wsscc.org before 12 September 2018. Water Supply and Sanitation Collaborative Council (WSSCC) and 3ie would like to invite you to a webinar for WASH practitioners: How much evidence do we have on the effectiveness of WASH interventions? Hugh Waddington, the Senior Evaluation Specialist at 3ie, will discuss the findings of 3ie’s Evidence Gap Map and implications for policies, programmes and research on this field. Click here to access the webinar – and tune in on Thursday, September 13, 2pm-3pm (CET). Read ahead: the 3ie WASH Evidence Gap Map and WASH EGM Brief. For more info, access our website. 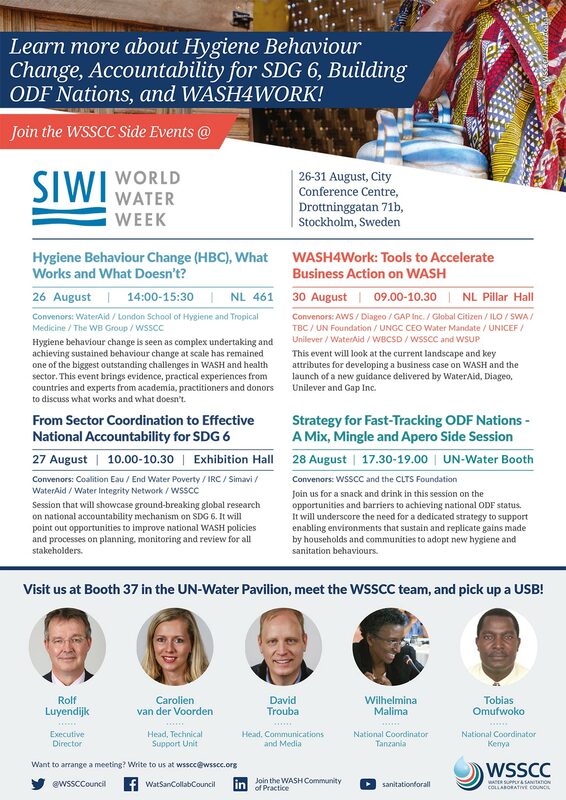 Join WSSCC and Partners at the 2018 World Water Week in Stockholm!